When the Continental Congress initially met in 1774, its first order of business was to elect a President who would function as Head of State and even preside over its deliberations. These fourteen Presidents were the giants of their age, men of power, wealth & experience who led their new nation through extremely difficult days largely on the strength of their character. This is their story. Unless otherwise indicated, all other photographs are from the Tom Chorlton Collection. Hardcover, Paperback & Digital editions available Now! This book weaves a rich tapestry that provides previously unknown context to the initial founding of the United States of America. Many history books are written as dry, pedantic lists of dates and places with little attempt to breathe life into the stories. In contrast, THE FIRST AMERICAN REPUBLIC: 1774-1789 allows you glimpses into the thoughts of America's founders, and paints a detailed image of the culture and politics of the era. 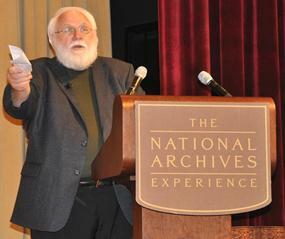 At long last, these giants of American History reclaim center stage. 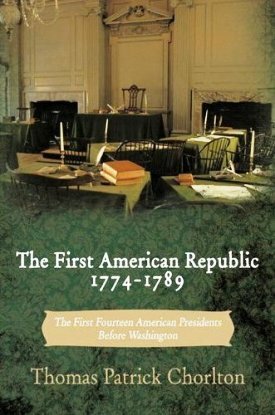 "The First American Republic: 1774-1789, is a significant addition to the understanding of the early days of the new American Nation...a real intellectual contribution." 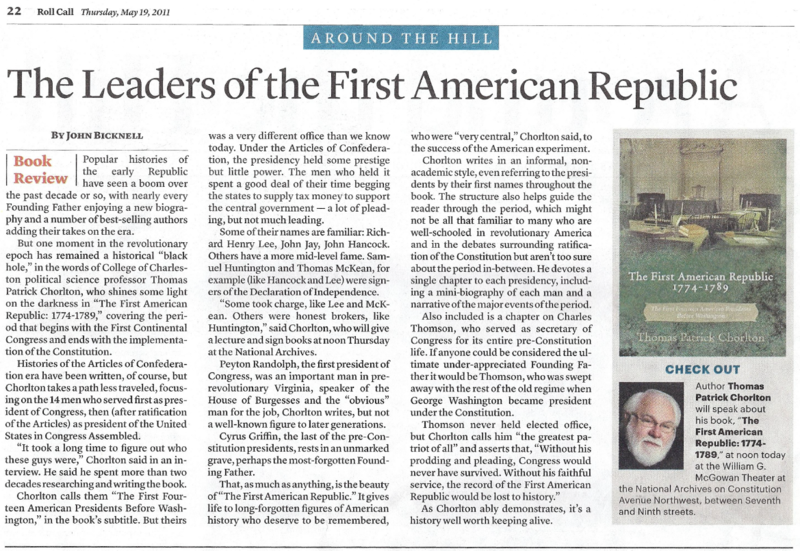 "Histories of the Articles of Confederation era have been written, of course, but Chorlton takes a path less traveled, focusing on the 14 men who served...as president of Congress...As Chorlton ably demonstrates, it's a history well worth keeping alive." Select paragraphs from each chapter have been posted so that you can develop a feel for the book before you decide to purchase a copy. Enjoy! By the morning of Monday, September 5, 1774, most of the delegates to the Continental Congress had arrived in Philadelphia. North Carolina would present its credentials nine days later. Georgia wouldn't join for a year. Some members had been in the city for several days, eager to meet and evaluate their colleagues from the other colonies. A few, such as Sam and John Adams of Massachusetts, were already well known by reputation. In contrast, Joseph Galloway, the Speaker of the Pennsylvania House of Representatives, and Peyton Randolph, the Speaker of Virginia's House of Burgesses, were best known because of their elective positions. The most famous American, however, was not there that morning. Benjamin Franklin was still living in London where he had already served for 15 years as an agent for several of the colonies. The 43 men who did gather that cool, damp morning at Smith's City Tavern (Philadelphia's newest and finest) were well aware that they were about to take a fateful step into history. The King himself had denounced their gathering. Parliament could easily decide to use the full weight of the British Empire against them as it had recently done to the colony of Massachusetts. The path ahead was perilous. No one dared to utter the word "independence," and few would have identified with such a cause. Some of the more conservative delegates were there expressly to sidetrack any discussion of the issue if it should arise. What they all agreed on was the critical need for immediate reform in the British Government's relationship with its American colonies. These men took their rights and their status as British citizens very seriously. They prayed that their King and his government would do so, as well. As John Adams recorded in his diary: "At Ten, The Delegates all met at the City Tavern, and walked to the Carpenters Hall" three blocks away. It was the closer of the two meeting places that had been offered to the delegates for their deliberations. The other, the Pennsylvania State House, was two blocks further west. Even before Congress officially opened, the political tug of war had begun. Adams and others feared that if they accepted the State House they might also be pressured into accepting their host, Speaker Galloway, as their first elected leader. Since Galloway was known to have loyalist tendencies, many of the delegates wanted to avoid such a trap. If a tavern closer to the State House had been selected as the gathering place that morning, the course of American history might well have been altered. Instead, when the delegates inspected Carpenters Hall "The General Cry was, that this was a good Room, and the question was put, whether We were satisfied with this Room, and it passed in the Affirmative."